Hit your system update option, PS3 owners, and you'll discover firmware revision 3.15 snuck onto Sony's distribution servers overnight. According to PlayStation Lifestyle, it includes a fix for a few issues introduced in the 3.10 update, and introduces PSP Minis to the PS3 itself. PSP Minis are Sony's bid to peddle relatively inexpensive, 'bite-sized' games. PSP owners have had access to the Minis catalog since October, but today's firmware update marks the first time PS3 owners can give them a whirl natively using an emulator. 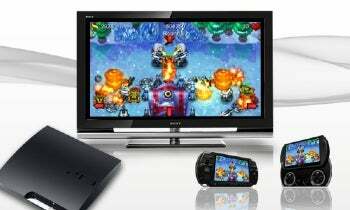 As of December 17, all PSP Mini releases will work on both the PS3 and PSP, and players who'd previously bought one for the PSP will be able to pull it down again, gratis, for use on their PS3. All that's left to do? Rebrand them PS Minis. Other additions reportedly include Bluetooth and trophy synchronization fixes, an XMB icon for Minis save data, and more intriguingly, a LAN data transfer utility that lets players wire two PS3s together with a standard Ethernet cable to transfer save data. Of course that's probably of little use to any of you with massive external USB drives, who already routinely backup save data, music, or video files without complaint. No word if it'll let you bring across 'locked' save data, like the save files in Atlus's Demon's Souls--if it did, it would suddenly be a lot more interesting to guys like me, who have two systems (debug, retail) for occupational reasons. Sony US hasn't put a blog entry up for it yet, but Sony EU chatted about it preemptively on Tuesday.